Uncolored Frequency Reproduction. Digital and Analog Input. Adjustments for Room Acoustics. 90-Watts of Mind Blowing Audio. input and a TRS 1/4" phone jack forbalanced or unballanced inputs. The BLOW series also features DA-912 PLUS interface module. DA-912 PLUS can connect various digital inputs such as AEU/EBU(XLR), S/PDIF(Coaxial/Optical) and Coaxial through its connector. 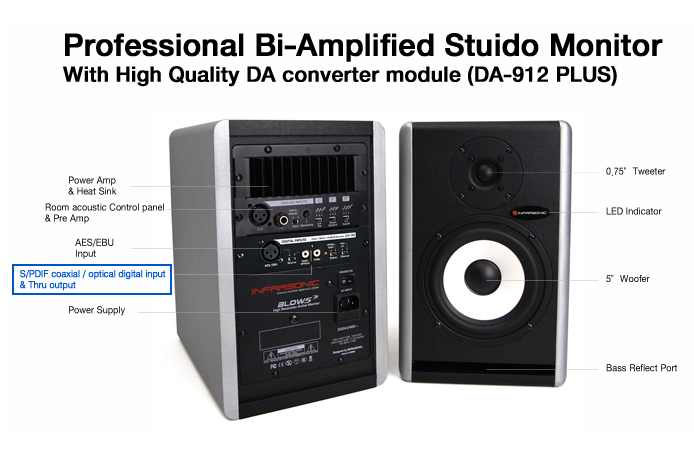 The D/A converter in the DA-912 PLUS supports up to 24-bit/192kHz sample format with 123dB dynamic range. DA-912 PLUS upgrade available for optional purchase. Blow5# contains various components in itself to deliver perfect sound quality. The enclosure is divided completely by the high density MDF wall to remove resonance interference from electric parts room. And it features lots of built-in circuit such as power amp, pre amp, DA convertor and room acoustic control in the rear panel. better quality sound reproduction through a wide range frequency. For ideal frequency response from overlapping, BLOW5# features a steep slope that dramatically reduces peak / notch. H.F Tilt, Room Control and Low Cut off Filters are able to make your perfect sound monitoring environment. The mechanical relays are placed between the power amp and speaker to avoid any the pop noises while you turn the BLO5# on and off. It��s greatly helpful for tweeter and woofer protection. 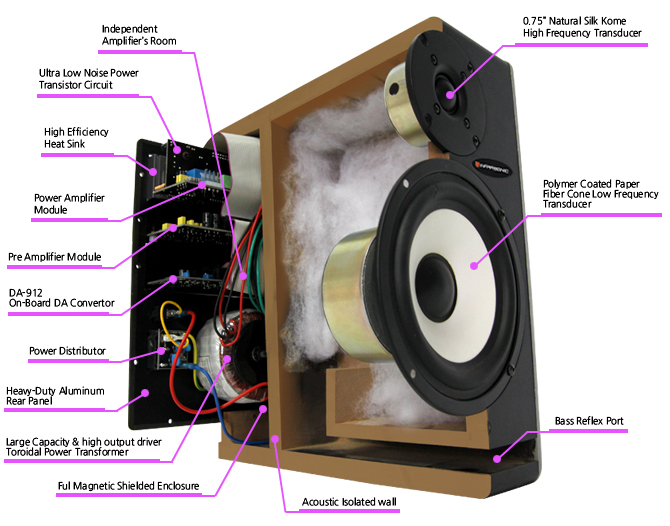 BLOW5# includes various circuits to protect the amps and speakers. Over-current limit circuit, Over-load protections, DC protection, LF-Amplifier Soft Limit Circuit, Power Monitoring Protection. To deliver the perfect acoustic environment, the cabinet is completely isolated from both the electric parts and heat sink in the rear. The additional shields inside of the cabinet lets the speakers work without any resonance and electric interference. It Supports AES/EBU(AES3) and S/PDIF 192 kHz with 24-bit and 123 dB dynamic Range available.